I learned that today April 2nd is World Autism Awareness Day you can read more about it HERE. Light it up Blue to show your support! I happened to be wearing a mani with something blue so it worked out perfect and I'm dedicating it to World Autism Awareness Day. 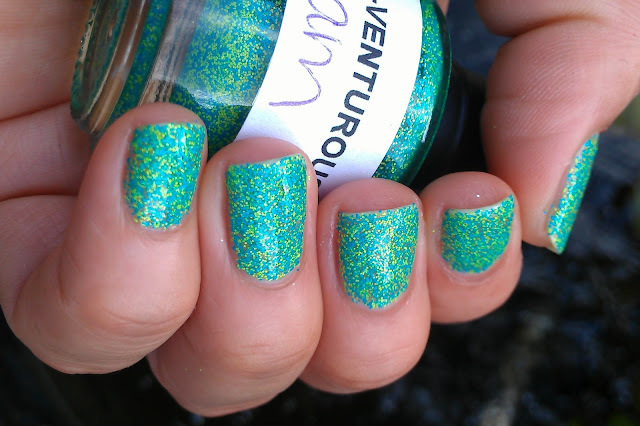 This is Nail-Venturous Floam, I'm pretty sure most if not all of you have seen this polish already and also have heard that is very unique. It is very different from anything I own! Amy has created some really great polishes, I am lucky to have a few of them :) The formula was great, it looked thick on the brush, but application was great! The pics show 2 coats plus top coat! I was taking these pics out in the backyard yesterday and the Mr. suggested I take some underwater for the blue background, of course I had to try it... how cool does this look???? 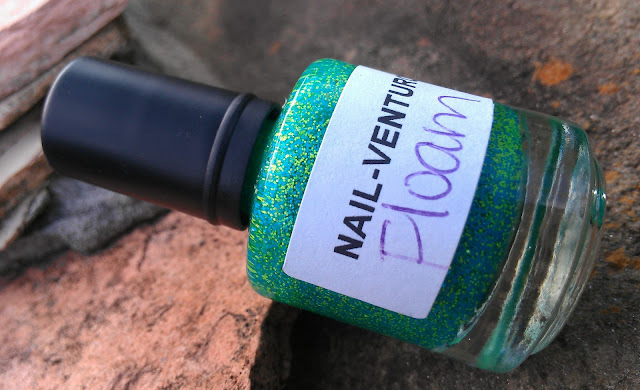 You can purchase Floam and other Nail-Venturous polishes on Nail-Venturous Lacquers Etsy Shop or Ninja Polish! The shop is closed now, may be re-stocked in 2-4 weeks and Ninja Polish is sold out, so I guess if this is in your wish list just keep an eye open for updates! Hope you all have an awesome day!!!! Looks great on you hon! Thanks Marisa :) I absolutely LOVE IT! You're so luckyyyy!! This polish is to die for! Looks really good on you! I really need to get this Poish! Such a unique shade, love it! I slowly break down each time I see this, I need it more and more LOL It's simply gorgeous! looks lovely on you! <3 its in my untrieds, lol. I had no idea you had gotten this! DId you tell me this:??? Saw Blue Jay-too glittery for me-but this is cool! I love this polish, it looks great! I really love this polish and it is stunning on you! 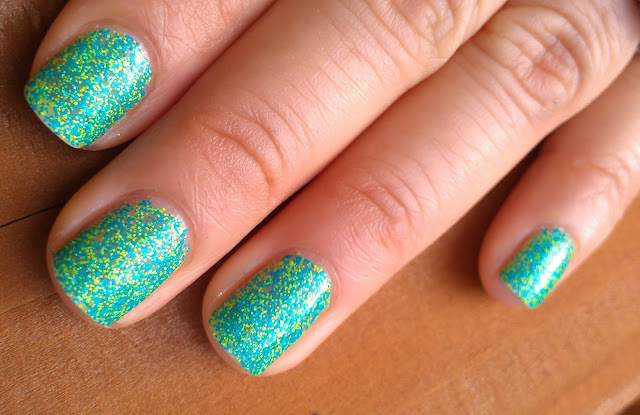 *Dies* I love this polish and hope that I can own it some day! Soooo unique! I'd say these are pixelated nails, lol! I love Floam! And your support for Autism Awareness is appreciated! As a teacher of children with autism, spreading awareness is greatly appreciated! I'm so jealous! I have been dying to pick this one up! It's gorgeous!! i LOVE her polishes! appreciate your support! You're so lucky you got your hands on this! 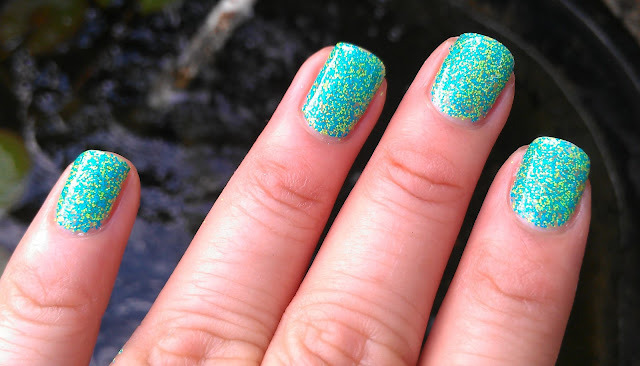 I love the polishes she made :) This one was one of my faves! Looks amazing! This is so cool! Really unique, I have undoubtedly never seen anything remotely like this. OMG AMAZING! I love the underwater pics, it looks so cool! I just love all these indie brands lately, their creations have blown mainstream polishes out of the water! yes, it has taken over completely!!! Love it! It looks like its hard to remove, is is? I took it off last night, removal was not so bad, it was actually a lil easier than regular glitter. Your Mr. Is so smart! the underwater picture ARE lovely! !